Why Can't We All Get Along? Energy crackles through PEN Oakland’s new collection of poetry and prose, in which 125 works distill radical politics and the need for social justice into passionate literature. Pieces span the spectrum of human emotion: from rage, as in Floyd Salas’s declamation against torture, to grief in CB Follett’s “Words to the Mother Whose Son Shot My Son,” to joy and contentment in the work of California poet laureate Juan Felipe Herrera. They range in subject from Kitty Kelley’s exposé of the revenge tactics of George H. W. Bush to Paul Krassner’s account of the night Ken Kesey invited him to a Grateful Dead concert at the pyramids of Giza. 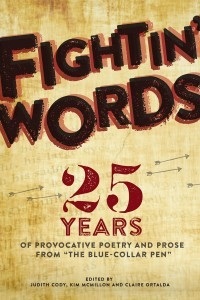 Featuring works by luminaries such as Rebecca Solnit and MacArthur Fellow Ishmael Reed as well as writers you will be glad to meet for the first time, Fightin’ Words bears witness to a vibrant American literary tradition well outside mainstream consciousness. Judith Cody is an award-winning poet and composer. Her publications include Vivian Fine: A Bio-Bibliography (Greenwood Press) and a collection of poetry titled Eight Frames Eight. Cody has also edited several publications, including the first Resource Guide on Women in Music and a NASA division history. Kim McMillon has over twenty years of experience producing theatre in the San Francisco Bay Area. In 1987, Ms. McMillon wrote, produced, and directedVoyages, A Multi-Media Excursion Into Reincarnationat UC Berkeley’s Zellerbach Playhouse. In 2000, Ms. McMillon wrote, and produced Confessions Of A Thespian: When Spirit & Theatre Collide at the Julia Morgan Theatre in Berkeley. From 2001–2005, Ms. McMillon produced the Oakland Literature Expo with PEN Oakland as part of the City of Oakland’s Art & Soul Festival. Ms. McMillon’s radio show Arts in the Valley aired every Saturday on 1480 KYOS AM in Merced, California. She is currently enrolled in a doctoral program at UC Merced’s School of Social Sciences, Humanities and Art. In the Spring of 2014, Ms. McMillon in collaboration with UC Merced’s Office of Student Life and Center for the Humanities produced the UC Merced Black Arts Movement Conference 50 Years On. Claire Ortalda is the editor of several books, including The Other Side of the Closet (IBS Press) and Financial Sanity (Doubleday). Her fiction and poetry has been widely published in literary journals and anthologies. She is the winner of Georgia State University and national Hackney Fiction Prizes, among other awards.